Is your closet overflowing with clothes that you no longer wear or that doesn’t fit? Is your garage so packed full that you don’t eve have room for your car anymore? What about your old electronics that are collecting dust in a junk drawer? Why not cash in on clutter to make money quick and clean your home at the same time. You may be thinking, I don’t want to do all the work or have the tie to have a yard or garage sale. Selling your stuff these days is easier than ever with all the websites and apps, you can declutter and organize your home and recoup some money at the same time. Here are some sites that will help you cash in on clutter while you get your home in tip-top shape. Sell your gently used clothing, handbags, shoes and accessories on Thredup. It’s so easy to join Thredup, they even send you a free pre-paid shipping bag to send in your items with no cost to you. Once you try it out, you can refer your friends and receive a $10.00 credit to your account for each friend who signs up. If you have clothing that your children have outgrown, you can consign on MyKidsThreads. If you have old cell phones, laptops or tablets that are collecting dust, why not make some money off them? List your old smartphone or laptop with no sellers fees through Swappa. Swappa charges buyers a flat fee so there’s no cost to you. Gazzelle is another great option to sell your old electronics. Selling used textbooks can bring in some money depending on the book. You can sell used textbooks at Bookbyte. You enter the title or ISBN of the textbook that you want to sell and they’ll tell you how much they’re offering for it. You can sell your Home decor and furnishings through Chairish. Chairish pays to ship your smaller items and larger pieces are picked up at your home when they sell. They keep 20% of the sale price. Do you have old, outdated or broken gold jewelry laying around in your jewelry box? Why not get paid for your gold at SellYourGold. They pay for the shipping and your jewelry is insured up to $25,000. Do you have old antiques in your attic or artwork that no longer fits in with your decor? Or, do you have a knack for crafting? Why not sell these items on Etsy? Etsy is the top website for crafts, antiques, and artwork. You can create an account and list your items for free. Sell your unused gift cards on CardPool. You can get paid up to 92% of the card value. You can also earn $5 or each friend that you refer t CardPool. 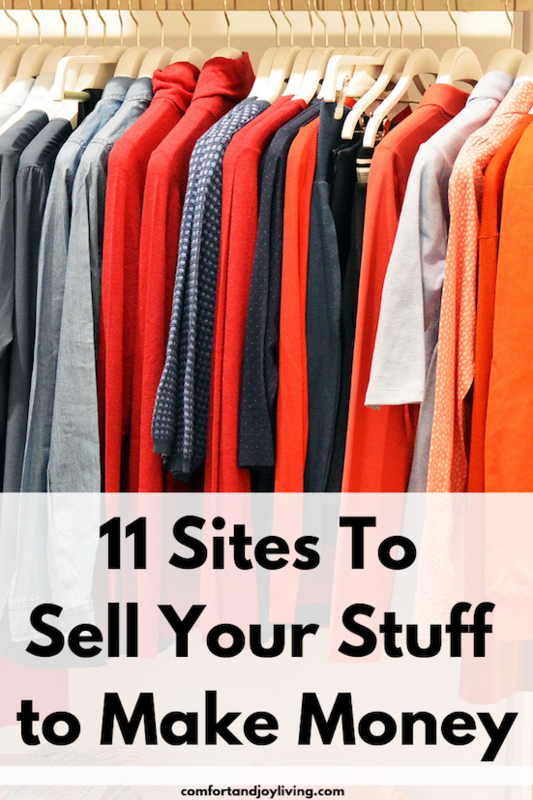 Everything else can be sold on sites like eBay, Amazon, and Craigslist.